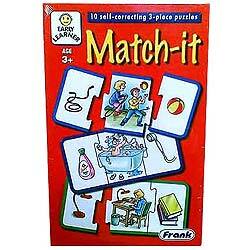 Match It is a fun puzzle for kids.This colourful game is specifically designed to develop logical thinking and enhance coordination skills. The familiar scenes depicted will motivate children to independently match the pieces. There are 10 self correcting cards. It is designed for 3 years and above.